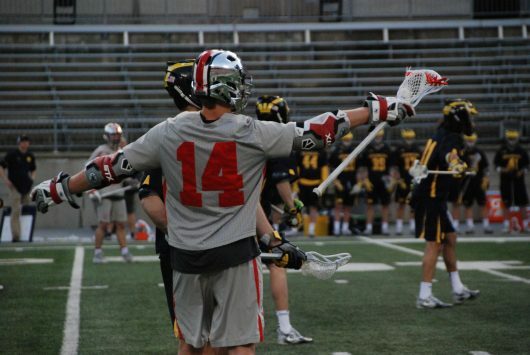 The Ohio State men’s lacrosse team has its work cut out Sunday when it travels east to defend its playoff chances against Maryland, the top team in the country. Mayland (10-1, 3-0 Big Ten) is a strong contender for its second consecutive national championship. 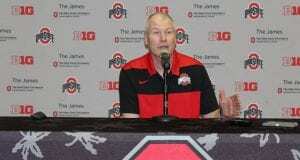 The Buckeyes are just trying to stay afloat just one season after losing to the Terrapins in the national finals. Fifth in the conference with two games remaining in the regular season, Ohio State sits just behind the top four teams that make the conference semifinals. The Buckeyes began the season with high expectations, but they face a scenario in which one loss could end their hopes at being back in the NCAA tournament. The last time the two teams met, Maryland edged out the Buckeyes in a 9-6 victory on the largest stage in college lacrosse: the 2017 NCAA championship game. Maryland brings a faceoff specialist unit led by freshman Justin Shockey that ranks among the best in the country. Additionally, the Terrapins have senior midfielder Connor Kelly, an offensive force whose 60 points this season are the most accumulated by any player in Maryland history since 1978. 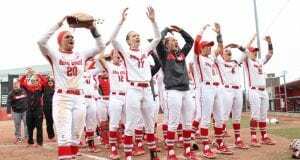 Ohio State’s much-needed win against Michigan Friday broke a five-game losing streak and allowed the team to feel victory, something it hasn’t had since March 4 with its 8-7 decision over Detroit Mercy. Topping Michigan was not the only source of pride for the Buckeyes this week. Ohio State senior defensemen Erik Evans and Ben Randall were selected in Wednesday evening’s Major League Lacrosse draft. They don’t want to move on to that stage just yet, though, because they are hoping alongside Myers that Sunday’s game will not be their last as Buckeyes. “Obviously anytime you have guys drafted it’s really exciting for them, it’s exciting for the program. Two guys we’ve relied on a great deal — Erik for four years, Ben for the last two years — both hopefully still have a lot of lacrosse left to play here in the scarlet and gray,” Myers said. With the season on the line, the Buckeyes’ game against Maryland will begin at 2 p.m. in College Park, Maryland.